By Jake Adams Corals are fascinating creatures to reef hobbyists for a number of reasons. Sure corals are beautiful, interesting and fun to grow, but they also have some amazing qualities that set them apart from most living things in our daily and reefing lives. For example, corals have the ability to be asexually propagated, they appear to be quasi-immortal and they have the ability to seemingly spring back to life when all that once remained was a bare skeleton. There is no magic under the hood of coral biology, but there are some really neat tricks that aquarists can expect from both healthy and nearly dead corals. Partial Mortality is an interesting concept that is very common in colonial animals and particularly well studied in reef building corals. Coral reef aquarists are very well aware of this concept even if it is rarely spoken about in such deliberate terms. More often coral reefers call episodes of partial mortality a type of recession, be it fast, slow or intermediate speed. 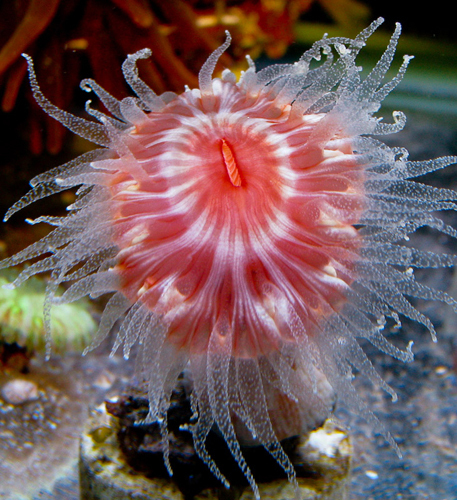 Since a colony consists of many individuals, the colony can suffer the loss of some or most of the individuals and still re-grow itself from the surviving polyps. Stony corals grow in a wide variety of colony shapes and their structure dictates what kind of partial mortality they can safely experience, and how that affects their long-term survival on the reef. Large massive corals most often experience some kind of bottom-associated partial mortality events such as sedimentation, or mechanical damage from nearby competing corals. When massive or plating corals experience some recession, they may grow back over the affected skeleton, or the tiers or plates may be stimulated to grow away from, or around the source of the mechanical damage. Sometimes the partial mortality can transect a coral and if the tissue does not re-colonize the bare skeleton, the colony may eventually grow into several closely spaced colonies. By the definition of the genus, Balanophylia species are non-colonial. In branching and foliose corals, the partial mortality may be due to sedimentation, self-shading, bio-fouling or a combination of these factors. This type of partial mortality is common in aquarium staghorn corals that can only grow so tall and branchy before the bases show some type of recession. Aquarists whose staghorn corals exhibit some basal recession need not worry about a little bit of recession at the base of their Acropora because this partial mortality is a completely natural occurrence, particularly once colonies reach larger sizes. In the wild this type of recession actually weakens the bases of staghorn branches, allowing them to break off and roll to a new position on the reef, thereby helping to promote the distribution and expansion of the colony. If the concept of partial mortality is taken to its most extreme example, corals may suffer damage beyond just a few of the colony polyps and individual polyps may become isolated from one another and those can die back to partial polyps. Depending on what kind of tissue remains–if totipotent cells persist after the episode of partial mortality– then the coral may spring back to life from the most minute traces of living matter. Totipotency is the ability for a cell to divide and differentiate itself into all of the different cell types that are normally found in an organism. All multi-cellular organisms have some form of totipotent cells at some point or another in their life. 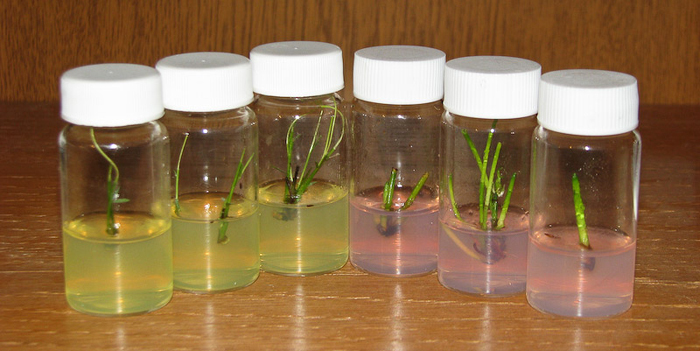 Totipotent cells include spores of fungi, zygotes of vertebrates and many different cell types of plants. Also, in some cases, certain animal or plant cells have the ability to “de-differentiate” from a specialized cell type back into a basic totipotent cell. Sarcophyton are a good example of a soft coral where most of the tissue is made up of totipotent cells. The phenomenon of corals springing back to life from imperceptible tissue has been described as the “Phoenix Effect” and it is most frequently seen in disc corals of theFungia, Cycloseris and Ctenactis genera. Many aquarists are well aware to never throw away the skeleton of ‘dead’ Fungia corals since it is common knowledge that these are particularly adept at springing back to life from seemingly nothing. Dave Krupp is a coral researcher in Hawaii who works with Fungia scutaria was the first to coin the term Phoenix Effect. As far back as 1992 Krupp observed that old, dead, F. scutaria skeletons were frequently peppered by similarly sized and whole new polyps of the same species ofFungia. Subsequent genetic testing revealed that these were in fact identical clones that likely arose from residual mesentarial tissues that persisted deep inside the skeleton and de-differentiated into totipotent cells to form new juvenile polyps. Although these polyps are often called anthocauli, these are in fact anthoblasts. Anthocauli are stalked juvenile polyps which originate from sexually produced planula, but the term anthoblast is reserved for the same kind of stalked juvenile which originates from de-differentiated tissue. Corals in the Fungiidae family have amazing powers of regeneration. The reason that some corals appear to have no tissue is because their skeletons are extremely porous and the totipotent cells persist beyond the outer skeleton that we see. Another group of stony corals with very porous skeleton includes members of the family Dendrophyllidae. Dendrophyllids include Tubastrea,Turbinaria, Dendrophyllia and Balanophyllia. These hardy corals don’t often die back. but they also have the ability to regenerate from the tiniest amount of tissue. Although we haven’t had access to Balanophyllia in the aquarium trade for very long, there is evidence to suggest that these may frequently experience partially mortality. By the generic definition, Balanophyllia is the same as Dendrophyllia except that it does not bud or branch. This was once a conundrum for identification because manyBalanophyllia are available as ‘colonies’. It is my personal belief that these are in fact not colonies of corallites but rather they are polyp clusters which are the result of a phenomenon akin to the Phoenix Effect. Balanophyllia occurs in habitats that experience periodic sedimentation. If the sediments rain down hard and deep on a solitary polyp, it may become suffocated to the point where the polyp dies back to the point of having isolated tissues deep within it’s porous skeleton. Once these tissues regenerate into new corallites, these clones will fuse at the base of their stalks, forming a larger cluster of corallites and the resulting coral may even have some hydrodynamic properties that reduce the likelihood of being ‘snowed in’ by deep sedimentation episodes. At first I was basing this on logic and observation. but I possess a single corallite of Balanophyllia bairdiana which died back to almost nothing during a tank crash. Following the recovery of the water quality, no fewer than five new corallites arose from the outside and inside of the corallum and I suspect this new corallite cluster will closely resemble the Balanophyllia ‘colonies’ which are now commonly exported from Australia. 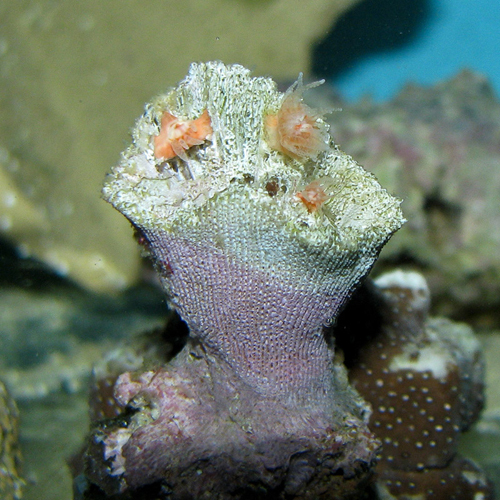 Under certain circumstances, Balanophyllia individuals may die back to very little tissue which can de-differentiate back into individual polyps. Another fascinating aspect of the regenerative ability of corals has enabled researchers to develop methods of tissue culturing corals even after they had been cryogenically preserved. By isolating coral tissues into small bits of totipotent cells, scientists are now able to store living coral tissues in suspended animation at extremely cold temperatures for very long periods of time. Being able to store coral tissues cryogenically means that they can be more easily transported around the world without worrying about the immediate metabolic needs of whole polyps or colonies. 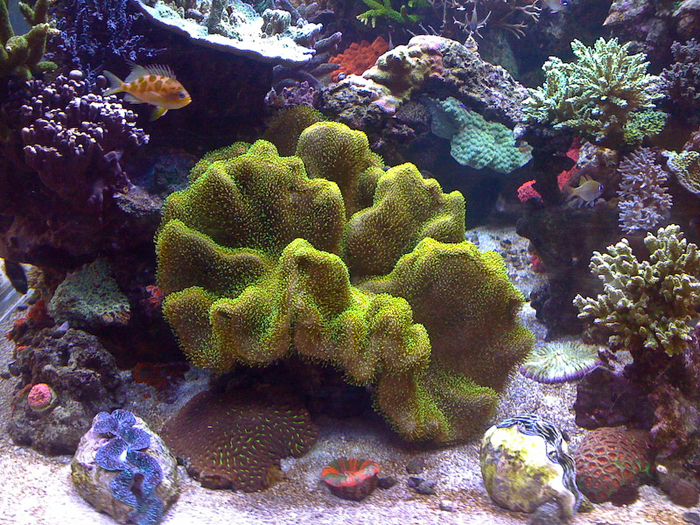 Being able to tissue culture corals means that we can make many new polyps from just a small sample, which is a technique that should prove useful for propagating large polyp stony corals such as Scolymia, Acanthophyllia and other desirable LPS corals which are not yet widely propagated in the aquarium hobby. The regenerative abilities of corals are simply astounding and there is a lot of things that have yet to be harnessed from it. Half a billion years of evolution to deal with partial mortality and the Phoenix Effect has produced a group of organisms which is well equipped to cling to life in ways we do not yet understand. We as hobbyists are just beginning to scratch the surface of what is possible in terms of coral propagation and it is almost guaranteed that the next decade is going to eclipse the previous one in terms of advancements in biological manipulations of corals. It is my hope that this article will elucidate the possibilities of novel coral reproduction and spark the minds of ambitious bio-engineers who see the potential of propagating corals in exciting new ways. Perhaps one day aquarists will be able to push the limits of the Phoenix Effect to something that resembles the mass tissue culture of aquarium plants.